However, her friend's daughter (the one expecting the baby) is having a boy and hates blue! She refuses to do the whole 'blue for a boy' thing and is doing the nursery completely in neutrals, which works fine for a boy, but just isn't what we normally do for baby cards. So, Doodle Pantry to the rescue! I found the sketch at Tuesday Morning Sketches. 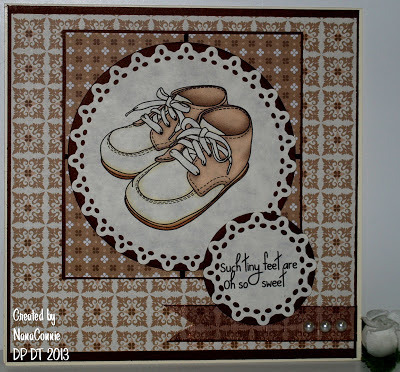 Laurie included wonderful digital papers with the "Baby Shoes" set, including the two I used which are in wonderful neutral tones. 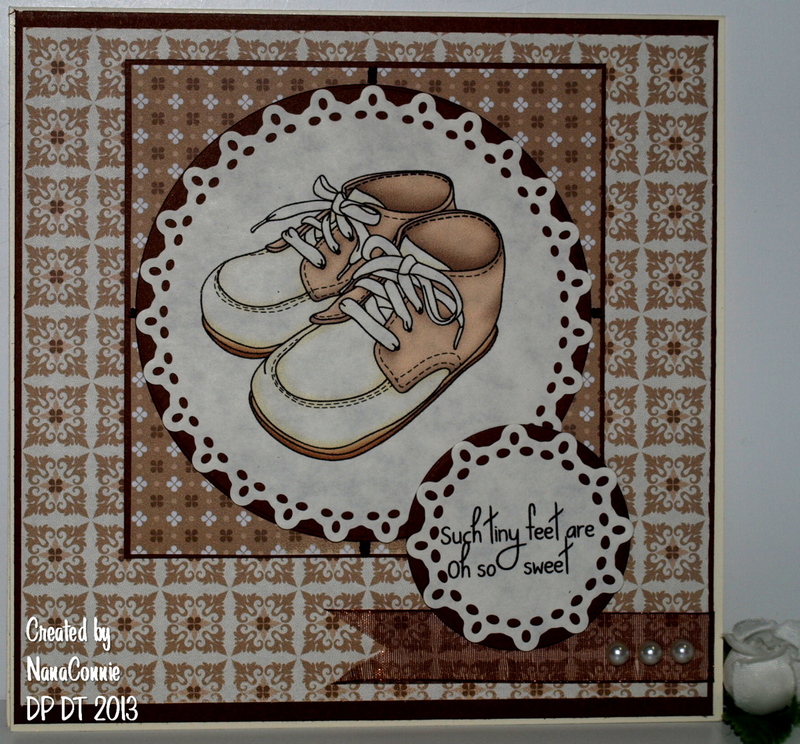 I die cut the image with a die I bought more than a year ago and haven't used recently and also die cut the sentiment (part of the Baby Shoes set) and matted them both with brown CS which has been in my stash for a good, long time. I also matted the dp with it. I added a strip of sheer brown ribbon and adhered the three little pearls to it. I thought that was still a very CAS design, lots of open space (though not white space,) and with an overall masculine feel to it. 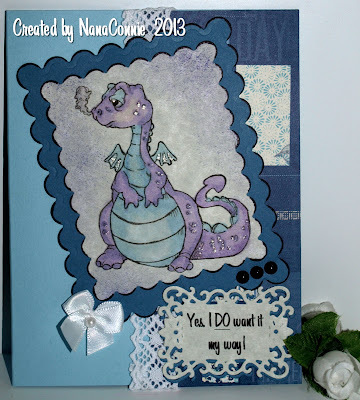 I wasn't sure I was going to like a baby boy card without blue on it, but I am very pleased with it after all. It did cool down somewhat on Sunday but I still stayed in and made cards. This one had me smiling and thinking of my granddaughter who adores dragons. The sentiment fits her pretty well, too, and it just seemed to express in words what's on the dragon's face. :-D The image is from QKR Stampede and their challenge this week is "Ribbons and Bows." 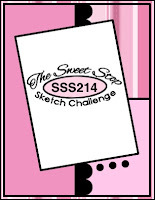 The sketch came from Sweet Stop. I used my Promarkers to color the image and added Stickles to a few spots on his wings and body. He's die cut, then matted with a die cut a size larger. The dp is from DCWV, Juniper Berry stack. The sentiment is mine, done with a computer font and then die cut with a lacy die. The lace ribbon was in my stash and the bow is one of those I make and keep ready in my stash. New challenge today at 613 Avenue Create and we're sponsored by the generous and wonderful Paper Shelter! I am growing my collection of their adorable images and having one more added is a pleasure. Our theme this week (in addition to the Anything Goes which is always our theme) is "Congratulations" -- any event for which you might wish someone congratulations; wedding, anniversary, new baby, graduation, promotion or new job, ... you get the idea. 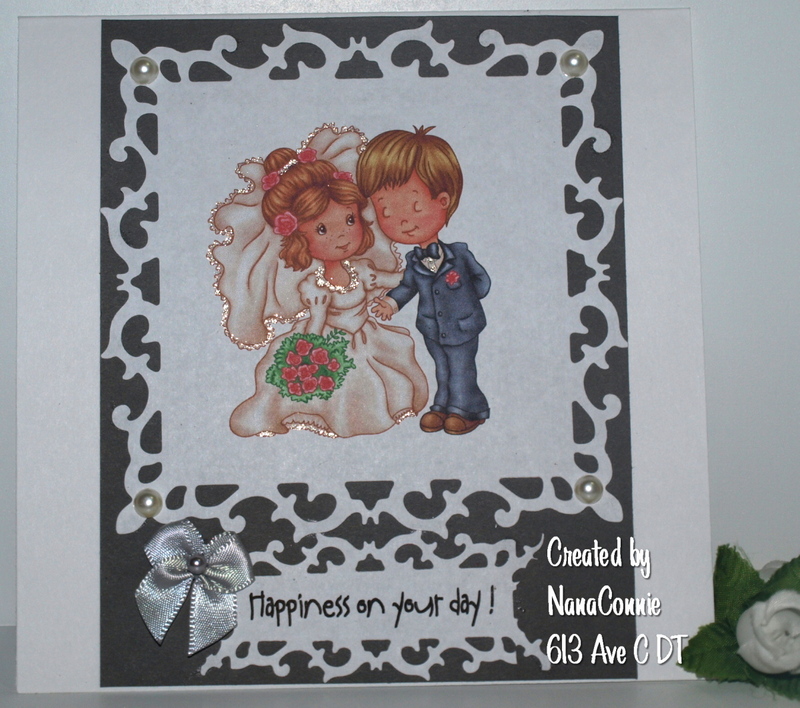 I used the "Wedding Couple" image from Paper Shelter. 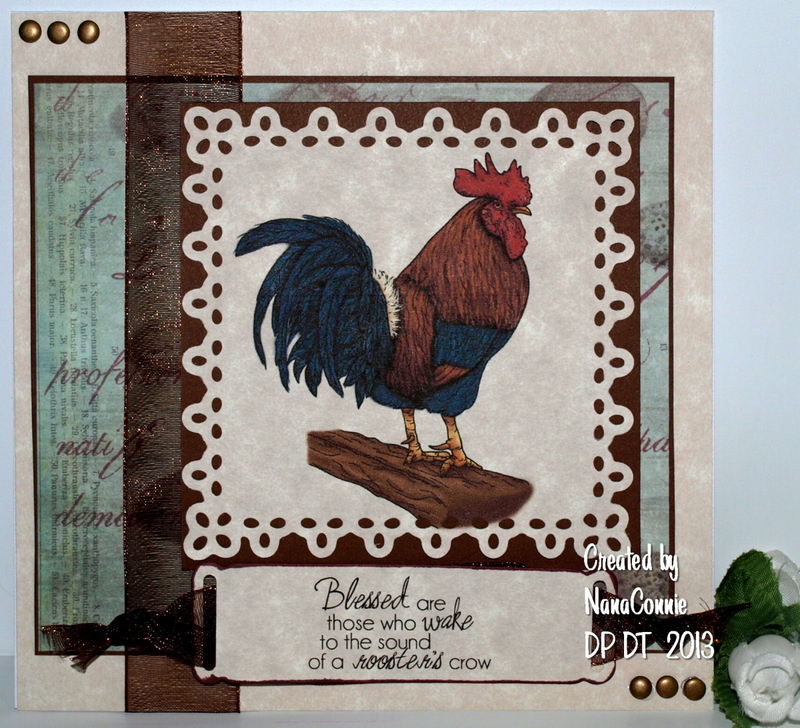 The image is cut with a "Fleur de lis" die from Spellbinders and the sentiment was computer printed and then cut with the same die. For the sentiment, I just cut the top and then shifted the position of the die to the bottom. That set is all squares and none of them fit the shape of the sentiment so I did some adjusting. I think the cut is rather interesting. 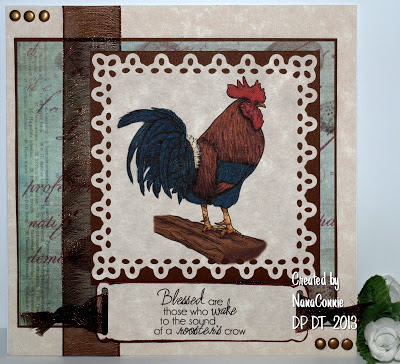 I had no idea when I first saw this new release "Rooster" set at Doodle Pantry that I'd be making it into a Father's Day card ! Quick story and then I'll show you the card. I was very short on time, having been gone so much of last month so I printed a pre-colored version of the rooster (doesn't Laurie do a great job of coloring?) I had it lying on my computer desk when an out-of-town friend dropped by unexpectedly. I was thrilled to see her because it's been nearly 6 years since she moved and we've only been able to e-mail and talk on the phone occasionally. 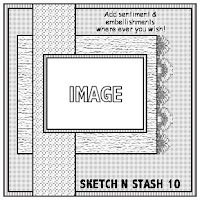 Sketch is from Sketch n Stash. I die cut the image and matted it with brown CS. The background dp was in my stash and it was a leftover scrap. The sheer brown ribbon came from my local craft store. 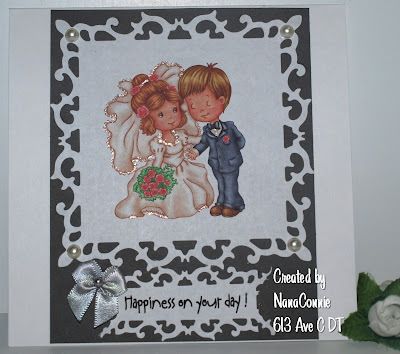 The sentiment is die cut also and threaded with that same ribbon. Although it's a bit hard to see in the photo, I just tied the ribbon ends in a know and cut them on an angle before attaching the sentiment piece. 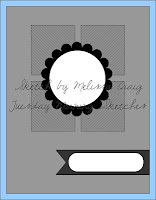 Since it's a masculine card, I added three brads to each of two corners and called it finished.